Hillary Clinton’s family policies need bipartisan support. Hillary Clinton’s family-friendly policy proposals would need bipartisan support. It’s happened before. 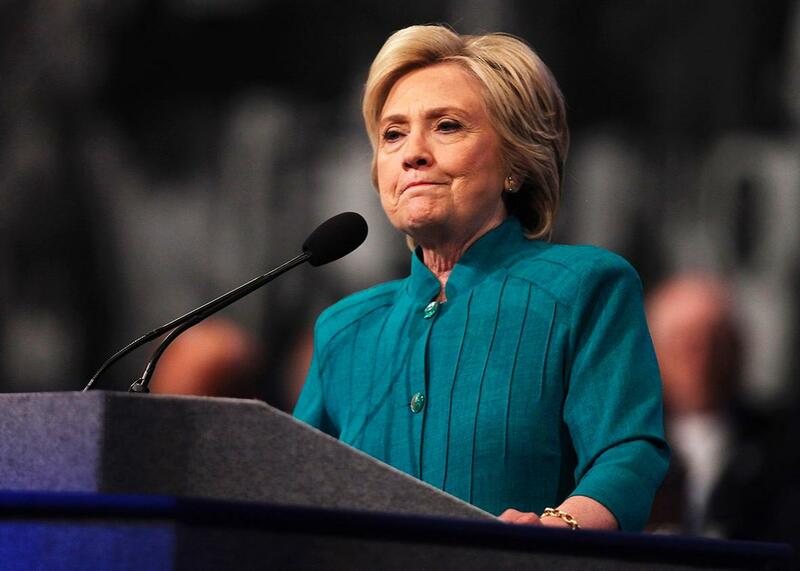 Hillary Clinton addresses the American Federation of State, County and Municipal Employees at their conference on July 19 in Las Vegas. 2016 is shaping up to be the year of the working mother. Never before has a presidential election focused so much on the struggles of families balancing child-rearing with paid employment. At the Democratic National Convention in Philadelphia, Hillary Clinton and her surrogates—including New York Sen. Kirsten Gillibrand on Monday night—are highlighting two policy proposals that could become as central to the Clinton campaign as health reform was to Barack Obama in 2008: a guaranteed 12 weeks of paid parental and sick leave, and an ambitious plan to use federal subsidies and tax credits to cap child care costs at 10 percent of every family’s income, whether the family is poor, middle-class, or affluent. These policies stand to benefit men, too. But the current unequal balance of care work—in which mothers do twice as much child care as fathers—means Clinton’s agenda would most immediately help women. Her ideas for parents and children represent a radical step forward, even for the Democratic Party. In 2008 and 2012, the party’s platforms spoke of “modernizing” and “moving toward” paid leave, not guaranteeing it. In 2015, President Obama proposed a plan that would have raised the maximum child care tax credit from $1,000 to $3,000 per child. It was far less aggressive than Clinton’s proposal to cap child care costs as a percent of income, and $3,000 would have remained wholly inadequate. Nationwide, a year of center-based day care costs over $10,000, on average, and as much as $30,000 for a high-quality program in a major city. The typical American family spends 29 percent of their net income on child care, compared to 4 percent of net income in Sweden and about 10 percent in France, Germany, and Denmark. Clinton’s big ambition is necessary if we want to reap some of the benefits that generous child care policies have provided to other nations, such as smaller academic achievement gaps between rich and poor children, and smaller wage gaps between mothers and fathers. Clinton’s running mate, Virginia Sen. Tim Kaine, and his wife, Virginia Secretary of Education Anne Holton, are well-positioned to help move the Democratic Party toward a more aggressive agenda on family supports. They are among the prominent Democrats urging an education policy focused less on test scores and more on structural barriers to success, including the lack of access to quality early child care and education. So perhaps the most surprising recent development on the family policy front was when Republican delegates cheered enthusiastically for Ivanka Trump last week, after she promised in her convention speech that her father would make “quality child care affordable and accessible for all.” It is easy to conclude that Ivanka’s comments had more to do with promoting her forthcoming book, Women Who Work, than supporting her father’s candidacy, which has never championed family leave or child care. Nevertheless, there is a historic precedent for bipartisan cooperation on this issue. The Nixon administration initially supported a plan to expand Head Start, the federal preschool program for poor children, into a national day care, pre-K, and after-school program open to children at all income levels. Under the Comprehensive Childcare Development Act, parents would have paid child care tuition on a sliding scale according to their income—a lot like Clinton’s proposal. A companion piece of legislation, the Family Assistance Plan, would have provided all poor families with cash income, requiring parents to enroll in job training or education if their children were receiving government child care. The politics were complex. On the left, the National Welfare Rights Organization, an activist group of poor mothers, resisted work and training requirements tied to the provision of child care and welfare benefits. Because the Head Start expansion would cover only the hours until 3 p.m., Minnesota Sen. Walter Mondale, a liberal stalwart, worried the legislation “would force mothers of school age children to work even during the hours when the children are not in school.” Meanwhile, the emergent Christian Right cast day care as an affront to traditional family values. Nixon’s programs would “Sovietize our youth” declared the conservative magazine Human Events, which imagined children ripped from their mothers’ arms and subjected to institutional care. Social conservatives hoped that denying middle-class families child care would keep married, white mothers out of the workforce. The opposite happened: Big economic changes, such as the shrinking of the manufacturing sector, meant that most male workers could no longer support a family on a single income. At the same time, feminism opened professions to college-educated women, leading more mothers to desire to work outside the home. Between 1965 and 1980, the number of working women with children exploded from 3.5 million to 17 million. Today, more than half of all mothers work during their child’s first year of life, and 64 percent of mothers with children under 6 work for wages. Paid leave alone cannot serve these families. No matter how generous a leave policy is enacted, there will come the day for almost all parents when leave is over, and they will need to find child care. That Republican delegates in Cleveland heard such a message from Ivanka Trump—and even applauded it—marked a significant departure from the party’s boilerplate rhetoric since the Nixon years: that children are best served by mother care, and to the extent paid child care is a necessity, it is a private responsibility. Many conservatives greeted Ivanka’s speech skeptically. But others, including International Women’s Forum director Claire Lukas, writing in the National Review, used Ivanka’s remarks to argue for free-market approaches to child care, such as … expanding the child care tax credit. That’s the exact policy Hillary Clinton is running on. Could a new child care consensus emerge, rekindling the hopes of the early 1970s? Maybe. But it would need to overcome many barriers. Clinton says she would pay for child care and paid leave by raising taxes on the rich, an idea that could galvanize opposition among fiscal conservatives who have historically opposed government spending on family supports. In 2008, New Jersey got around this problem by creating a paid-leave system funded through a small employee payroll tax. Expanding that program nationwide, however, would technically entail raising taxes on middle-class workers—something Clinton is loath to do. But in a nation where 75 percent of mothers now work for wages, access to child care ought to be as fundamental a right as access to K-12 education—which was, by the way, also considered a radical and expensive reform that threatened traditional family relationships back when the idea of public schools first came to prominence in the 1830s. Nearly two centuries later, some have wondered whether Hillary Clinton has a big idea that’s as motivating to the American people as affordable health care was for Obama eight years ago. Here’s her idea: To help children thrive, we need to support working parents, especially mothers. A quality education begins at birth, with parents bonding with their infants during parental leave, and then enrolling them in affordable, quality child care. Will Clinton promote this idea strongly and centrally during her Philadelphia address, directly answering Ivanka Trump’s parry? Here’s hoping. Read more coverage from Slate on the 2016 campaign.